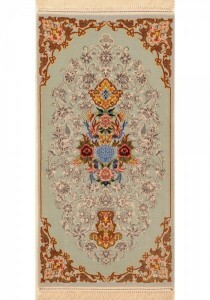 Isfahan rugs are regarded as some of the finest quality of rugs woven in Iran. 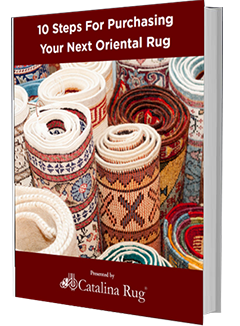 Although the rugs that originate from this region come in a wide range of qualities, a fair amount of production is specifically dedicated to producing high quality pieces. Most of these rugs are woven with a wool pile on cotton or silk foundation with a few specially woven with silk accents running right through the pile for an absolutely stunning effect. The rugs are dense and constructed with a higher than normal knot count but despite their denseness they remain quite malleable, which in itself speaks highly of the quality of the work. The weavers who work on these rugs use a wide palette of bold colors in their work but the predominant colors that are featured include indigo, bright red and deep blue on a background of ivory. 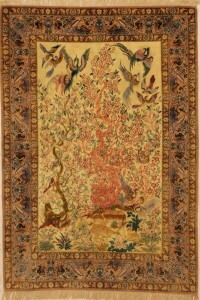 Isfahan rugs are woven in the Isfahan Province, which consists of over 15 districts and several counties. 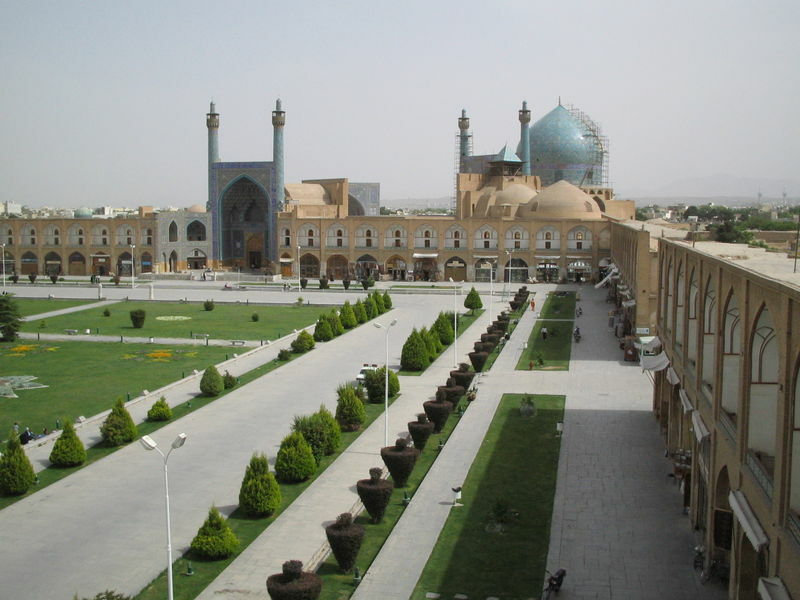 Isfahan is an important city of Persia and a major weaving center in the country. The Safavid kings who ruled the area were huge art lovers. When it come to art of all types, nothing but the best was good enough for them. They attracted and encouraged artisans and craftsman across all niches, from rug weaving to painting and architecture. To get the best from these skilled craftsmen, fine materials were acquired and given to them to practice their art. Some of the art pieces that remain from that era are still a huge attraction for art lovers from around the world. With the huge amount of stunning artwork amassed in one location, the city of Isfahan was eventually declared a world heritage site..
Rug weaving flourished in this region during the Safavid era but the craft became stagnant when the Safavid dynasty ended after Iran was invaded by the Afghans. It was not until much later, sometime in the 1920s that the people of Isfahan took up weaving again in earnest. 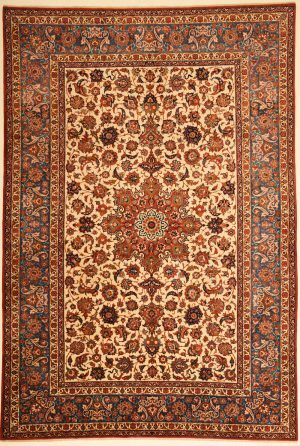 They slowly went back to their centuries old tradition of weaving the characteristic Safavid designs and eventually become an important nexus of the Persian rug weaving industry. 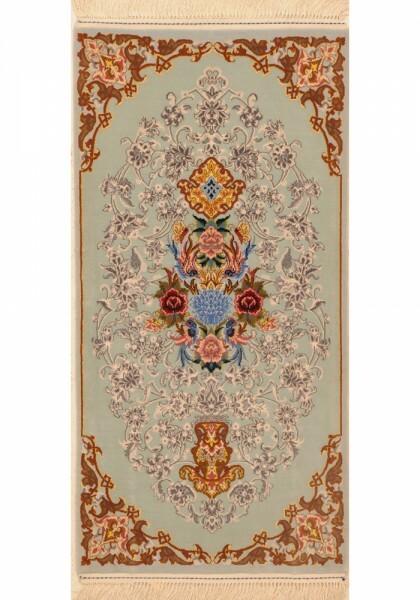 Today, they are amongst the most wanted variety of Iranian rugs amongst serious rug collectors around the western world. 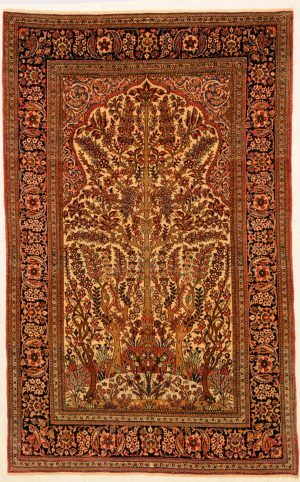 Isfahan rugs are knotted on either cotton or silk foundations with a knot density of up to 1000 knots per inch. The wool used for the pile was the best quality available – Kurk wool. Vertical looms used to manufacture these rugs using double wefts and Persian knots. The colors used in these rugs are very distinctive. 12 colors are usually used to create the designs which were woven on a field of ivory. Deep blue, bright red, bold earth colors were used in abundance. Some of the newer pieces have a more subdued palette to make them more compatible with Western home décor. The designs of these rugs were typically symmetrical and balanced, with palmettos and vines surrounding a single distinct motif. Other designs that are featured on these rugs are the allover Shah Abbas, Tree of life, pictorial schemes, hunting and vase but the most commonly seen design remains the medallion and triangle surrounded by a variety of flowers and islimies or vines.